Being a small business, we’re pretty particular about what we invest money in. Our goal is usually to try to do something ourselves first, and when we realize we can’t, then hire it out. Sometimes, however, investing a little bit in something else pays dividends. Today, we’re going to talk about a paid app we’ve come to adore called CoSchedule. It’s a social media scheduling platform that connects to pretty much every social platform and WordPress. You can write a blog and schedule all your Tweets, Instagrams, Facebooks, Tumblrs and whatnot in an easy-to-see calendar. Disclaimer: I’m not a paid advocate for this product… yet. Why Should You Schedule Content? Over the past few weeks, we’ve spent some time talking about different social media. If you’re like most authors, you’re trying to juggle your writing career with a full-time job, and perhaps a family, too. Marketing probably doesn’t rank high on your list of things to do (although it should). 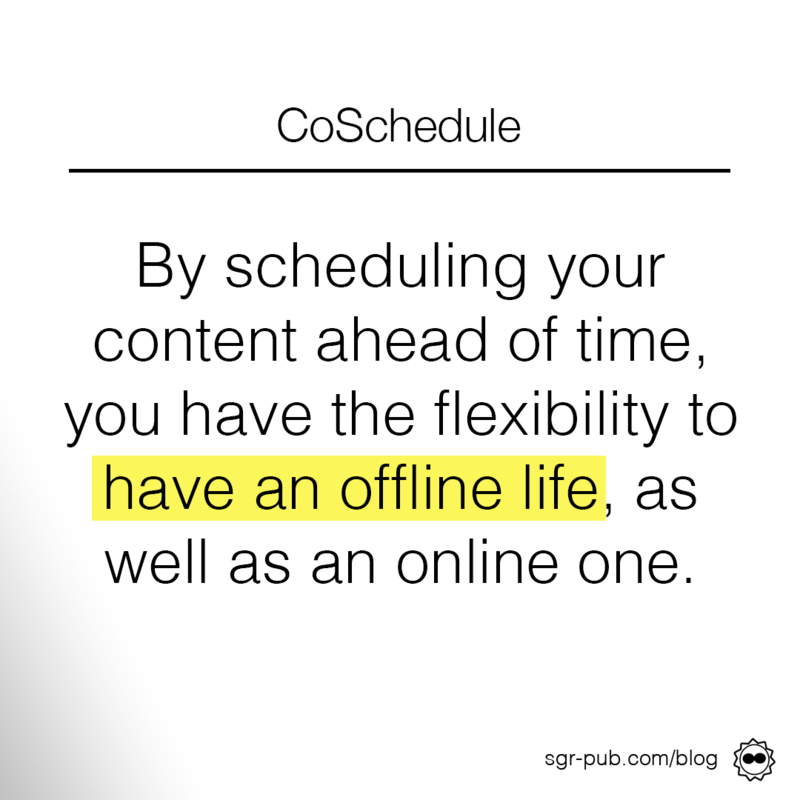 By scheduling your content ahead of time, it allows you the flexibility to have a life, as well as maintain a regular presence across different media. You shouldn’t schedule everything, of course. Regular human interaction is important, too. We’ve tried a couple different tools, but CoSchedule is far and away the best for our needs (we’ll talk about Buffer next week). In the first place, since we’re managing two separate (but occasionally overlapping) social media brands, CoSchedule makes it easy to put together campaigns. Our weekly SGR-P blog posts are cross-posted across all ten of our connected social media accounts, alongside whatever S. Usher Evans is doing that week. We can take a look at each day and level-out if we’ve got too many messages on Monday, or not enough on Tuesday. We can also filter by social media account (to check the number of tweets or Instagram posts) or by campaign/tag. It’s been very helpful as we try to juggle multiple campaigns, from these blog posts to book releases to hosting other authors on the blog. Our best-loved feature in CoSchedule is the ability to create “templates” of social messages. For example, these blog posts get the same treatment week after week. 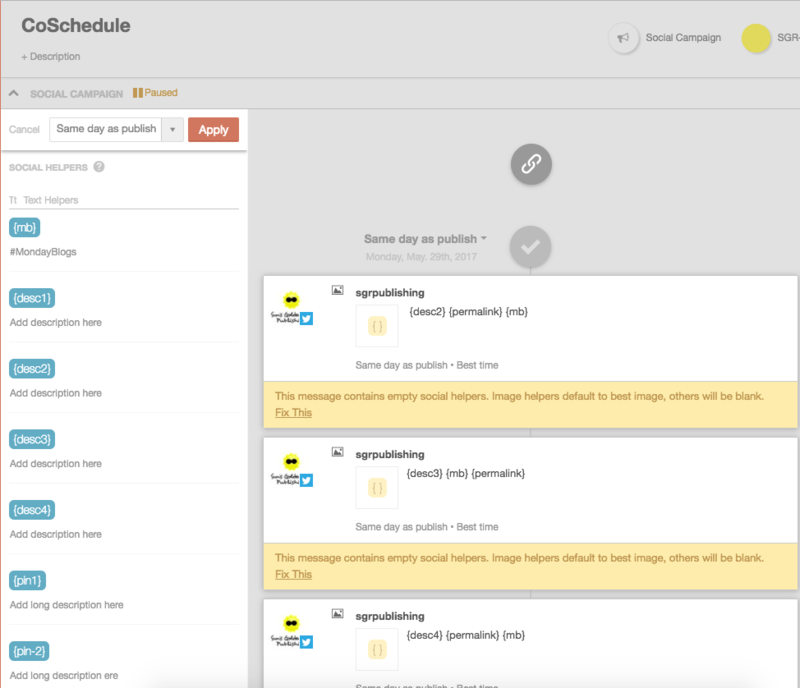 CoSchedule’s Social Campaign feature lets us set up “text helpers” (reusable phrases) and “image helpers,” then put them in a queue of Facebook posts, tweets–even Instagram posts and Pinterest pins. 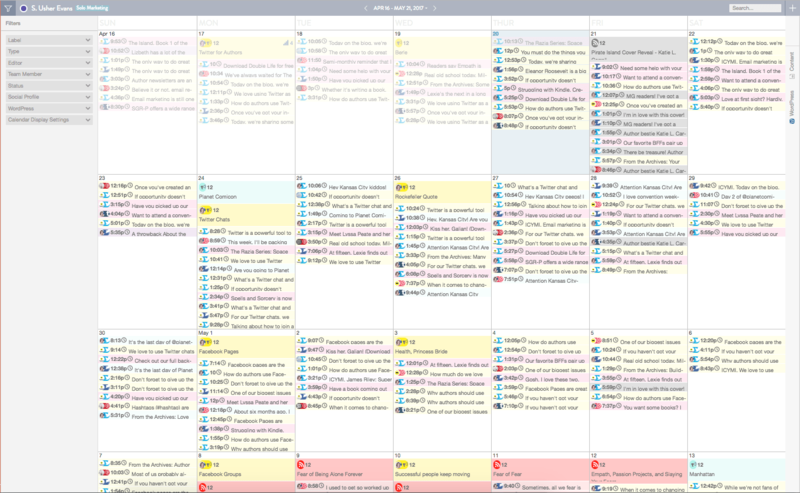 For those of us who blog on the regular, having all this already set up means an hours’ worth of social media scheduling is wrapped up in about 2 minutes. Speaking of Instagram, we LOVE using text helpers for all those pesky hashtags. We have a set that we use for all posts and then leave a blank placeholder for post-specific hashtags. Our favorite CoSchedule hack is to use templates and text helpers for Twitter Chats. We’ve got a template set up for promo tweets (which start 2 weeks before the chat). Then, on the day of, we have 10 template questions that we fill in with specifics and images. There’s no scheduling, no worrying about the hashtag–it’s all done for us! What used to take us several hours now takes 10 minutes, including the time to dream up questions. As we said above, it takes a really great product for us to throw down some business dollars to invest in. But for our money and for what we’re trying to accomplish, CoSchedule is worth every penny!